Please join us for cocktails, dinner, dancing, strolls down memory lane, and lots of laughs. Free parking. Cash bar. Dress: casual chic. $110 per person starting May 1 and at the door. If you prefer, you can send a check payable to "Walter Johnson High School Class of 1966 reunion" for $100/person to the attention of Mike Burrows, our reunion treasurer, at 1523 Hugo Circle, Silver Spring, MD 20906. Please note your name and your spouse/guest name (if applicable) with your payment. Please allow enough time so that checks arrive by 4/30/16. To kick off our reunion weekend, join current students and staff for a tour of the renovated and updated WJ. Sign in at the main entrance by the WJ plaque on Friday, May 13, 2016. What better way to launch our 50th reunion weekend than with a socializer at a location we all know & love! 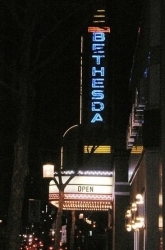 It's a homecoming at the historic Bethesda movie theater, which is now a popular live music and dining venue in the center of town. Catch up with childhood friends at special areas dedicated to our elementary and junior high schools, too. Find friends and head off to dinner. We'll have sign-up sheets for group reservations at restaurants within walking distance. Dress: casual chic. When: Sunday, May 15, 2016 at 1:35 pm. The Nationals are recognizing this as "Walter Johnson Alumni Day." Bring your family and friends for a winning event. Dress like a Nats fan, curly W!